Love GirlGuidesCANblog? What post would you like to share with us? We’re always happy to hear from girl and adult Members, volunteers and supporters! I was a Guide leader for years before my daughter Claire came along. I have confidently taken other people’s daughters camping, taught them how to use irons, drills and hot glue guns, how to lay and light a fire and to make pancakes on a camp stove. I spent years fundraising and planning our Pathfinder Unit’s trip to Our Chalet before cheerfully waving them off on their adventure to Switzerland. All the while I have noted parents’ anxiety when they dropped their little ones off at camp, and wondered at their reluctance to leave. Well, I will wonder no more. Claire. Photo Courtesy Karen C.
My now five-year old daughter is ready for Sparks. She is so excited. Having grown up around Guiding she takes it for granted that Sparks is going to be awesome. After all, Claire has known the Spark leader her whole life and simply adores her. She has come to realize that the cool things in shopping bags by the door on Wednesdays are for the Guides and not for her. Things like giant marshmallows, shiny new craft supplies and sporting equipment. Claire and her father have dropped me off at camp and countless meetings, events and sleepovers. And now it is my turn to wave her off on her own adventures. Oh no! Now I know how much thought, planning and care goes into every meeting and event. I know firsthand that the girls’ safety is paramount for our organization. Guiders are trained in everything from first aid to Outdoor Adventure Leadership and we must get Safe Guide approval for everything that we do. That won’t stop my heart from being in my throat when I drop off my little Spark and walk away to wait anxiously at the nearby Starbucks, cell phone in hand just in case. You may be wondering why I haven’t joined Claire’s Spark Unit. I am a Guider after all. Well there are two main reasons. The first is that I am a Guide and Pathfinder Guider at heart. I love working with those age groups. They are interesting, capable and their programs are right up my alley. While I love my children, I have to admit that I am completely exhausted after each and every play date. I have stepped in and helped out with the odd Spark and Brownie meeting over the years and have a huge appreciation for anyone that chooses to work with those age groups. I am not one of those women. The second reason is simple. I am my mother’s daughter and Claire is a mini-me. My mother was my Guide leader for a few short months before she realized that for us both to get the most out of our Guiding experience she really needed to work with another Unit. And she was right. I have to admit that I was the classic “leader’s daughter” and how Mrs. Racine put up with me until Mum moved to the Thursday night group I will never know. But once she did I excelled at Guides. And so did Mum. So come September I will be dropping Claire off at Sparks. I will applaud her at her enrollment and bring her to bridging events and even buy her a sleeping bag for camp and sleepovers. And when she is ready for Guides, who knows? Maybe by then I will be ready to check out Brownies for a few years. Until then I will continue to be her biggest cheerleader, encourage her to reach for the stars and secretly clutch my cell phone until I pick her up again. By guest blogger Karen Cross: “I have been a Guider since 2004 with the 146 Toronto Guides and I am now also a Community Guider in Community 18 in Ontario. I was a member of the 13th Chateauguay Guide Company when I was a girl.” Read previous posts by Karen on our blog: Guiding with Baby On Board, and Rock the Mall. 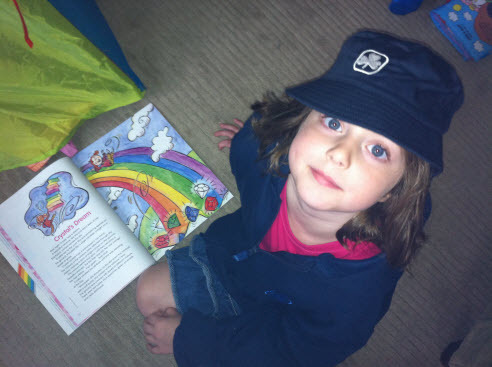 This entry was posted in Girls' Guides and tagged female role models, parent. Bookmark the permalink. Thanks for your essay, Karen! I too am a long-time Guider looking ahead to my daughter (also Claire!) starting Sparks next fall… unlike you I’ve been assuming that I would join her unit with her, but you’ve given me some good reasons to reconsider. I am a PF/Ranger Guider at heart and the idea of a dozen 5-year-olds in a room makes me twitch, so we might both be better off apart… not to mention the inevitable mother-daughter dynamics, which sound very familiar too!